Gold improved overnight in a range of $1313.70 - $1321.65. It ticked down to its low of $1313.70 during Asian hours, when the DX firmed to its high from yesterday at 90.17. Later during the evening, a rebound in the euro ($1.2294 - $1.2335) and continued yen strength (106.35 – 105.60) pressured the dollar down to 89.89, which lifted gold to its $1321.65 high. Global equities were mixed with the NIKKEI off 0.6%, the SCI was down 0.7%, Eurozone shares were up from 0.2% - 0.6%, and S&P futures were unchanged. 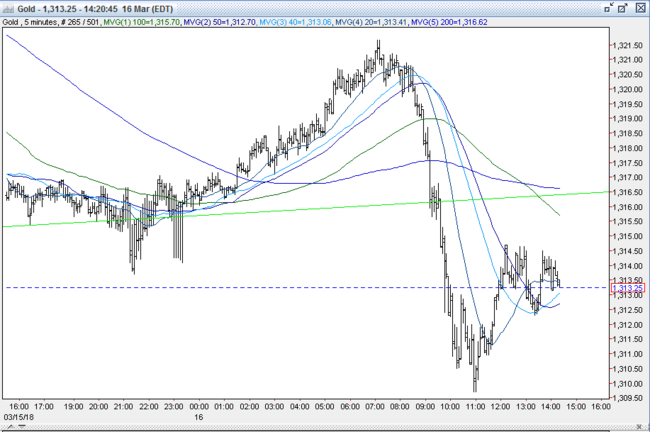 Oil prices were modestly higher (WTI $61.11 - $61.40) and supportive of stocks. Ahead of and through the NY opening, S&P futures (2753 - 2760) and the US 10-year bond yield (2.81% - 2.835%) firmed - despite a miss on US Housing Starts (1.236M vs.. exp. 1.290M) and Building Permits (1.298M vs. exp. 1.325M), with today’s quadruple witching options expiration day likely playing a role. The DX firmed back over 90 to 90.08, and gold was pressed to $1316.50. Later in the morning, stronger than expected readings on Industrial Production (1.1% vs. exp. 0.3%) and Capacity Utilization (78.1% vs. exp. 77.7%) were followed by a better than expected U. Michigan Sentiment Report (102 vs. exp. 99.3) and a stronger JOLTS reading (6312 vs. exp. 5917). This took US stocks higher through their open and into mid-day (S&P +14 to 2762). Equities were also boosted by news of a “truce” between Trump and Chief of Staff Kelly on further White House dismissals. The 10-year yield climbed higher, reaching 2.859%. The dollar continued to rise, and took out some resistance at the double top at 90.17-18 to reach 90.38. Gold sold off hard, taking out some sell stops under $1313-15 – (quadruple bottom, lows 3/2, 3/9, 3/12, 3/13, and the uptrend line from 12/12 $1236 low) to reach $1309.70. Into the afternoon, US stocks pulled back to unchanged, and the US 10-year yield dipped to 2.84%. 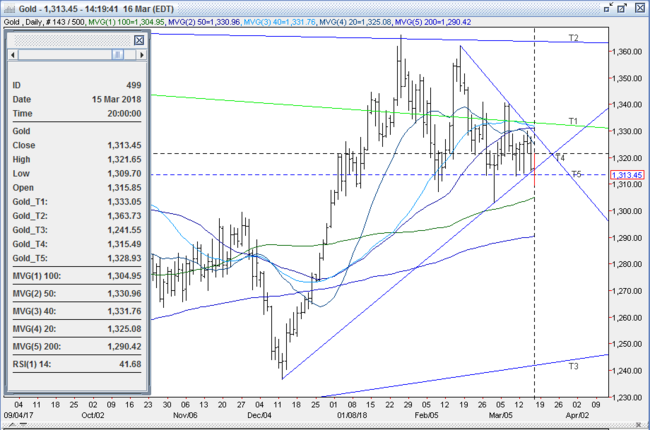 The DX similarly retreated to 90.20-25, and gold clawed back to the former support level at $1314. Open interest was up 4.8k contracts, showing a net of new shorts (along with some bargain hunting new longs) from yesterday’s decline. Volume was a little lower with 275k contracts trading. All markets will continue to focus on the volatility in the equity and bond markets, geopolitical events, developments with the Trump Administration (especially tariffs / dismissals), oil prices, and will turn to this afternoon’s Commitment of Traders Report followed by reports Monday on Japan’s Trade Balance, Eurozone Trade Balance, Construction Output, and commentary from the Fed’s Bostic for near-term direction. Looming ahead next Wednesday is the FOMC meeting, where markets are largely (94% probability by FedWatch) expecting a 25 bp rate hike.